How to prevent occurrence of zoonotic diseases | Infonet Biovision Home. 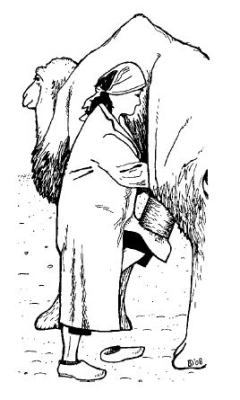 A woman wearing protective clothing has less risk of an infection while milking a camel. Adequate measures can be taken to prevent zoonotic diseases that are broadspread or even worldwide, but can also be taken locally, for example in your own house or on your own farm. The level at which prevention is possible is shown in Table 1. This chapter provides some practical advice for each level and ends with advice for the particular risk groups mentioned in Section earlier. 1 Prevent animals from becoming infected: if they are not infected, they can produce better, they cannot infect other animals and they cannot infect people. 2 Prevent humans from becoming infected: if they are not infected, they will not get ill and they will not infect animals or other humans. Some preventive measures will prevent animals from becoming infected, while others will prevent humans from becoming infected. Other preventive measurements protect both humans and animals. Here, we will only focus on animal level and farm/community level. Source: "Where there is no vet"
Owners should ensure that healthy animals are not in close contact with sick animals. It is important to keep separate towels, blankets, saddles, feed bowls and other equipment for the healthy and the sick animals. Ringworm, for example, is a skin disease that spreads very easily when the saddle or rope that was used for an infected animal is also used for a healthy animal. Another measure to prevent animals from becoming infected is to use mosquito repellents in the stables. Making use of artificial insemination can prevent diseases that spread through mating. Artificial insemination stations are likely to check the sperm of the male animal for diseases before they give it to a female animal. For instance, if the sperm is infected with the zoonosis brucellosis, it will not be used. There is a category of animals that makes prevention difficult: carrier animals. Carrier animals are animals that are not yet ill, or they may never get ill, because their immune system is able to keep the infection low. They look healthy although they are infected with microbes or parasites, which they could transmit to other animals. Give animals clean food and water; put the drinking bowls and hay racks so high up that dung and urine cannot fall into the food and water. Remove faeces from animal enclosures frequently (at least once a day). Do not keep animals overcrowded. Too many animals in a group can lead to fighting, more wounds (and more chance of infections of these wounds) and too close contact. Vaccinate animals against the important diseases in your region. Consult your veterinarian about this! Be careful with carcasses; bury or burn the dead animals. When an animal suddenly dies, always suspect anthrax. Keep animals in clean, dry places. Move enclosures and stables regularly and keep them clean, to avoid build up of diseases in one place. Make sure that the air in the stables is well ventilated. Ventilation removes the damp. Many microbes need damp to survive in the environment and to grow and multiply. Do not mix healthy animals with animals that are not healthy. If you purchase a new animal and you are not sure if it is healthy, keep it separate from the herd for a few weeks and check the animal for diseases. Work together with other farmers and with disease control programmes. More information about these programmes is available on the website of the Food and Agricultural Organization of the United Nations (FAO: www.fao.org) and on the website of the Office International des Epizooties (OIE: www.oie.int). Vaccination prevents humans and animals from becoming ill. Vaccines do not cure diseases! Vaccination sometimes prevents the diseases from spreading from animal to animal. How does vaccination work? If you get infected with a microbe, for example the influenza virus, then your immune system (blood cells) will fight the virus. This will take some time and you will get ill, but your immune system has a memory function. If in a few weeks later the same sort of flu virus enters your body, then your immune system will recognize it immediately and will be able to fight it faster than the last time. This time you will not get ill or only slightly ill. Vaccines work the same way. Vaccines are weakened or dead microbes or parts of parasites. Your body can easily fight them, but it also builds up defence for a next time, when a "real" microbe or parasite enters your body. Vaccines only work if they have been stored well and prepared well. Vaccines only work when administered at the right time and, sometimes, at the right age. Sick or weak animals must NOT be vaccinated! Do not use vaccines that have passed the expiry date. The frequency of human and animal vaccination depends on the disease. It is therefore important that you ask your local veterinarian or animal health worker for advice! More information can be requested from the veterinary information service of the DIO Foundation: vis@dio.nl or by mail: V.I.S. / DIO, Yalelaan 1, 3584 CL, Utrecht, The Netherlands. The first step in prevention of zoonoses is to prevent animals from becoming infected. But sometimes it still happens that a zoonosis infects animals. You then will have to prevent spread of the microbe from animals to humans. How you can prevent each of the discussed zoonosis from infecting people is explained in the text boxes in this book. But there is a slight problem? Most zoonoses cause no clear symptoms in animals. Often you will only see symptoms that look very much like the symptoms of another disease, such as influenza. Or the animal "is just not itself". It is a bit slower, does not grow very well, and may seem to be a bit weaker. In this case it may be another disease and not a zoonosis, but it may also be indeed a zoonosis! So it is important to be careful when an animal gets sick. Be aware that it can be a zoonosis. In certain areas in Bolivia, cysticercosis (from the pig tapeworm) is very common. In these regions, women who are specialized in diagnosing the cysts in of pig's tongues check every pig before it is sold. This influences the price of the pigs (healthy pigs are more expensive than pigs with cysts). This method of control is neither thorough nor certain; sometimes the women miss an infected pig. But this traditional system can be a starting point for further control measures. In countries where there is clean water, personal hygiene can be achieved by: washing your hands after you have been to the toilet; keeping the toilet covered and clean; washing your hands before you eat; and washing vegetables and fruits before eating them. All this will help prevent many diseases. Control of insects means cleaning food scraps that may attract flies and using insect repellents and mosquito netting. Personal protection against flies and mosquitoes includes wearing clothing with full length trousers and long sleeves. Boil water before you drink it. See if you can build a latrine and use it. If you have no latrine, do not defecate near the house and make sure you bury your faeces. Do not put your fingers in your mouth without first washing your hands. Make sure that animals cannot eat the faeces of humans. Pets are best fed and kept outside of the kitchen. If an animal becomes ill, contact your veterinarian. Keep animal food separate from human food. Extra care should be taken of risk groups: young children, old people, pregnant women and people who are already sick or weakened. This means that these risk groups should in no case eat meat or eggs that are not properly cooked; they should not drink water or milk that is not boiled; and they should not eat cheese made from raw milk. Make sure that you know the risks that apply to your occupation. For example, if you are a tanner, make sure that you know the risks to you from tanning and handling skins. Wear protective clothing (overalls, a sturdy overcoat, rubber boots, gloves), so that your skin is not in direct contact with the animals or animal products. Make sure that this protective clothing is different from the clothes you wear at home. Do not wear your work-clothes at home, because How to prevent occurrence of zoonotic diseases 39 if you do so you could bring microbes from your work to your home. Launder your protective clothing when dirty. Do this at work or let it be done by a professional laundry. Do not eat or drink in areas where animals, animal waste or animal products are present. So do not drink your beer next to a carcass in the slaughterhouse! Report all suspected sick animals as soon as possible to your veterinary service, so that protective steps may be taken. If you seek medical help for yourself, always remember to tell the doctor that you work with animals or animal products. Avoid touching your face and mouth with your hands while you are working. Wash your hands before you go home. Make sure that a first aid kit is available in case of emergencies. Disinfect equipment when you finish your job. Keep visitors out as much as possible! Or make sure that they wear protective clothing and boots too. Please be aware that none of these measures guarantee that you will never get ill any more! But they will reduce the chances of getting infected with an infectious disease.